On any given morning at any Arizona middle school or high school, a bell beckons students to class. Motley crews of interests, values, socioeconomics, genders, fashions, vernaculars, and other relations walk down halls, moving images of teen diversity. Teachers, administrators, staffers and volunteers are stationed, scattered mentors amid challenging statewide circumstances. Soon the one-minute bell warns students to be on time. Some pick up the pace, some slump shoulders, and some on smart phones or off campus didn’t get the message. Focused on bringing positivity to Arizona education, how do we help each other “converge” through voluntary and valuable language and media arts participation, in class and beyond? Henry Jenkins, in his book Convergence Culture, defines media convergence as “a situation in which multiple media systems coexist and where media content flows fluidly across them.” Convergence itself is “the flow of content across multiple media platforms, the cooperation between multiple media industries, and the migratory behavior of media audiences who will go almost anywhere in search of the kinds of entertainment experiences they want.” As articulated by this book’s 71 authors, teens crave more than entertainment and care about learning; learning that can and should converge through diverse media. What would reading be without the tactile feel of a book and a park bench for Socratic dialogue? Or, what could a book be if you also have a smart phone, a QR code reader app, and a QR code embedded in the cover? Scan the Read me. code on this cover and find a comfy bench. Teens also read on smart phones and Socratic dialogue can occur anywhere. “Old media” (print books, park benches, etc.) and “new media” (websites, smart phones, etc.) can dynamically interact, making it everyone’s responsibility to constantly rethink how to better locate diverse media into education, a premise “old” and “young” generations would be better served to agree upon. Convergence is more than mastering techno tools; it’s about connecting people and ideas. Once that final school bell rings, on any given day, how connected are we? Some stay engaged on campus, like English teacher Kevin Sheh and members of Desert Mountain High School’s Inkblot creative writing club. Outside of school, however, teens spend about 75% of their waking year off campus. Most head elsewhere after school which means educators, not just those beckoned by bells, should leverage convergence to earn place in learners’ lives. There’s much to learn. After school, Audrey Ennis leaves campus and “strides through the dojang’s glass doors,” finding the strength that inspired her personal narrative, Fears of a Black Belt. Wherever physically located, Arizona teens like Brenley Markowitz submit award-winning Scholastic Art and Writing Awards entries. Need the term “author” be stricken to print text publishers? Just ask Maxime Godart, whose 2015 Scholastic Art Awards submission “Boy” adorns this book’s cover. Students that reject Jane Schaffer-obsessed mind abuse crave communities to read and publish in. Nathaniel Larreau, author of Lost Your Chips and a Flagstaff resident, desires more local literacy groups to join and could start his own. For many teens, it isn’t that they don’t “get the message” to engage when bells ring; they get it but wander beyond seating charts for edification. This is where YAA, eager to collaborate with open-minded Arizonans, wants to help communities converge through YAArizona.org and partner spaces, online and statewide. So as you read the words and ideas of Convergence, imagine what your participatory role could be: Just reading? Enjoy. Using content to create and share lessons? Yes, please. Can you adapt a story into a short film, then link it to the story’s web page? Can you depict a story climax by painting it, then post the pic? This book wasn’t created to gather dust on your mind’s shelf. Whoever you are, reader, draw from this print book and feel welcome to constructively share as a convergence media co-author, blazing new language and media arts learning trails for fellow Arizonans. Using Convergence as inspiration for Scholastic Art & Writing Awards entries by December 16, 2015, could classroom assignments earn space in print and online? Absolutely, whether you’re a teacher or a student. Graduating Desert Vista High School student Simon Essig Aberg’s critical essay “Taking Up Arms” examines modern-day thematic implications of Homer’s Iliad. Mentored by teacher Ms. Amanda Moon, Sophie Sieckmann wrote “Bloody Mary” in her freshmen poetry class. Many creations come from class but workshop participants, lit mag contributors, art club members, other group members, and individuals are encouraged to submit Awards entries towards the end of the first semester, each year: the Awards as incentive to revise, to demonstrate portfolio-based assessment, to enrich what you do. Once works from any and all of Arizona’s 28 Scholastic Art & Writing Awards entry categories earn publication on YAArizona.org, YAA’s Tumblr, the Best Arizona Teen Writing of 2016, and potential partner publications that value convergence, could Arizona teen authorship have meaningful place in tomorrow’s lesson plans? Should we value the teachings of young authors like Kaly Arvizu of Tuba City and Justin Zhu of Chandler and Matty Ortega of Yuma and Rachael Merkt of Prescott and many more? Read for yourself and decide, but I’ll foreshadow some more of these 105 compositions. Navya Dasari’s flash fiction piece “First Summer Back” effortlessly transitions between ideas, reminiscent of F. Scott Fitzgerald at his finest. Nailah Mathews’ Windows isn’t her most, ahem, polished work but that’s not the point. Like an Impressionist Era painting, how the author captures details teaches us to appreciate the moment, as well as the drafting stage in writing. Kamren Gilbard’s journalism piece “A Trail of Tears” prompts dialogue on what we name our mascots. Isabel Marshall’s poem “A Whisper in the Frost” explores emotional and psychological states, embedding truths in a style I used to think only e.e. cummings could master. Sharon Vaz’s short story “A Walk of Hope in the Arizona Desert” inspires hope amid deadly circumstances. Do you teach satire in October? Read Alex Cohen’s “Something Wicked,” a humor piece, and be sure to put candy out next Halloween. As alluded to in last year’s editor introduction, I prefer Kit Kats. This is Convergence, the Young Authors of Arizona’s Best Arizona Teen Writing of 2015 anthology: by young authors, for Arizona, earned publication through the Awards. YAA is one of two Scholastic affiliates in America making our own “best of” book and we continue to make publishing a habit. To help language and media arts converge in Arizona, scan the Read me. 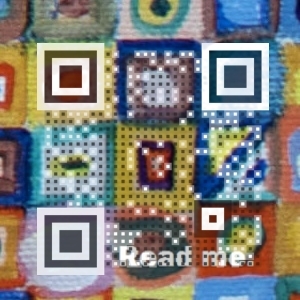 QR code or type in YAArizona.org/converge. Thank you for supporting our second draft. Scan, share, and print this “Read me.” QR code to help develop the Convergence: Best Arizona Teen Writing of 2015 digital version. For fun, as suggested by Managing Editor Julie Cain, read Nathaniel Larreau’s Lost Your Chips out loud in the voice of actor Sam Elliott. If anyone knows Sam Elliott, do you think he’d record a dramatic reading through YAA’s SoundCloud?